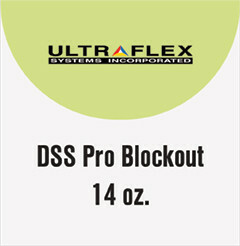 DSS Pro Blockout™ 14 oz. 14 oz. two sided matte blockout banner material. Smooth and printable on both sides. The refined scrim pattern and dual print surfaces were engineered for print professionals seeking a media with an as large as possible color gamut at high speeds with low ink consumption. The low curl formula is ideal for rollup banner stand, POP and any indoor hanging graphics.